The project comprised of scoping, detailed feasibility assessment, load profile analysis and tender documentation for a large solar PV system on Wilson Hall at Melbourne University. Enhars role also included evaluating tenders and project management of the contractor for the installation of the 100kW solar PV system. The building provided many obstacles to solar generation including structural limitations, heritage issues, limited roof space, difficult electrical cable runs, construction issues and strict time constraints for building works. 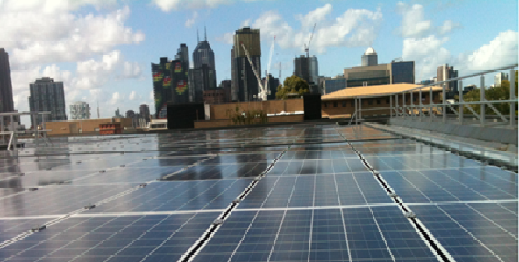 Due to the structural and heritage limitations of the building, and to maximise solar capacity, a flat mounted solar system was the only viable option for solar PV installation. Trina glass on glass, frameless panels were selected as the preferred solar PV panel to minimise pooling of water on the flat mounted array and increase cleaning intervals, comparatively to conventional framed panels where pooling of water at the frame would be an issue. The frameless panels presented their own unique installation challenges. Detailed request for tender documents were prepared by Enhar, included general specifications and detailed site and electrical information, which allowed for consistent tender responses and ensured quality products consistent with University of Melbourne requirements and site constraints. It was critical that the flat mounted array was duly considered in the tender responses, the difficult building constraints fully understood and the ongoing additional maintenance allowed for. Project management by Enhar and the excellent installation team ensured that the 100kW solar system was compelted on time and on budget in Feburary 2014.